Recently, I had the honor to speak with Danny Krysak, a Mars geologist I had met at one of my book signings. I knew I must not be the only person to have questions about what it means to be a Mars geologist, so I asked to interview him and he graciously accepted. I hope you enjoy this interview as much as I did! Please give a brief bio of yourself, including a description of being a Mars geologist. I have a masters degree in planetary volcanology in the field of geology. I went to the University of New York at Buffalo, where I studied Apollinaris Mons on Mars and remapped the geologic history of the volcano. It was studied in late 80s/early 90s using the Viking Orbiter data to determine its history. As time has progressed, the resolution of the cameras we have sent to Mars has increased, allowing us to see much more detail on the surface. I remapped the volcano using newer images, the CTX instrument in particular (which coincidentally was built by the company I work for). I determined that the original study was very accurate, which was very eye opening to me to see how much could be determined with data of that resolution. One of the more interesting things of my work was on a large fan-shaped deposit on the side of the volcano. The original authors said it was *probably* because of effusive lava flows (flowing lava), but they weren’t certain due to the resolution of the images at the time and said further study would be needed. When I looked at it, it became obvious that it was not effusive flows but more likely pyroclastic/volcaniclastic deposits. That was exciting for me to be able to say that we can see now that it was not effusive, but something else. I currently work at Malin Space Science Systems right here in San Diego. We specialize in building space cameras. 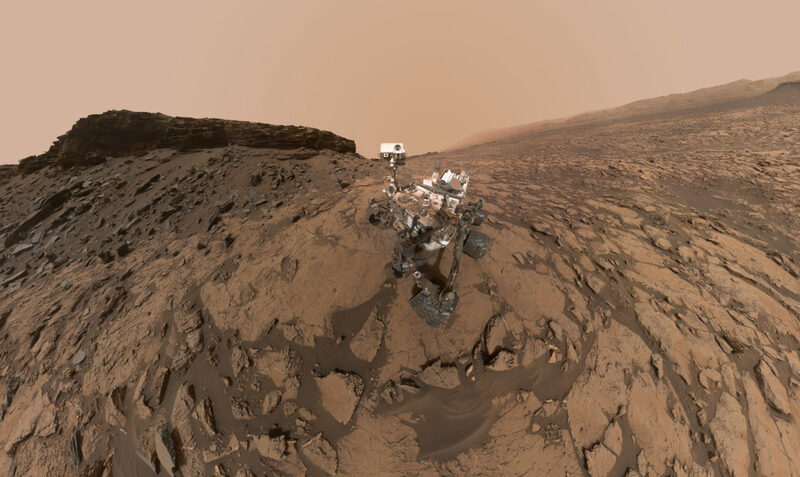 We currently have contracts on number Mars missions such as the Mars Reconnaissance Orbiter (in particular the CTX and MARCI cameras) and the MSL Curiosity rover (in particular, the Mastcam, MAHLI and MARDI cameras). In addition, we also have a camera on the Juno spacecraft at Jupiter called JunoCam. I work on the operations team for both MSL and Juno. On MSL, I work specifically on downlink assessment which involves looking at telemetry of the spacecraft and the images we’ve acquired. Specifically, we make sure the instrument is healthy and stayed within temperature range, check that all images that were supposed to be acquired that day were acquired correctly, ensure the camera is shut off at the end of the day and that nothing went wrong with the planned activities. If there is an error or something went wrong, we look at the available telemetry to figure out what happened. We communicate with the appropriate people, whether it’s engineers at our company or at NASA’s Jet Propulsion Lab (JPL). Once we have completed our assessment, we give our “go” to allow the uplink team to use the camera for planning the next day’s activities. Which came first, an interest in geology or an interest in Mars? Definitely an interest in space first. I’ve been interested in space ever since I was a little kid. My dad and I would always go out with the telescope at night and look at the stars and other deep space objects. Geology didn’t become a big interest of mine until later in college. I enjoyed the classes I took so much, I ended up getting a Masters degree in the field. I knew I wanted to go to grad school after college, so that was my chance to enter a specific sub-field of my choosing. In one of my early geology courses, my professor mentioned the study of planetary geology and that’s where the marrying of the two fields came from for me. The rest is history. Once I found out about that, I knew exactly where I wanted to focus my studies in grad school. What education and experience did you need to become a Mars geologist? For me it was working in geology in general and finding out about planetary geology. Planetary geology has obviously been enhanced with robotic spacecraft in the solar system. For me, getting the job I’m in now was a mix of having both the scientific background as well as having a strong technical background. I’m also a computer person as well. I used to be a computer science major but eventually switched to geology. I’m still a programmer on my free time, so having the two backgrounds worked out great since most types of planetary science are done with remote sensing. In my opinion, you really need to understand the technology behind the instrument that is acquiring the data as well understanding how to interpret the data itself. If I can command the camera and know what exactly I’m imaging, I feel that makes me that much more well rounded. Why did you decide to become a Mars geologist? At the time Mars was (and still is) an important planet with NASA. It’s our nearest neighbor in the solar system for one. There are a lot of interesting things about the planet and it’s analogous to Earth in many ways, although it’s much further along in its evolutionary chain than Earth. I think that’s part of the reason why so many people are interested in Mars. As an extension of that, that’s where a lot of the research I had available to me resided at the time I started school. My advisor was a volcanologist specifically, but she had a strong interest in planetary geology as well. There a few Martian volcanoes she was interested in working with at the time she took me on as a student, so it went in that direction and I couldn’t be happier! I usually get to work around 7 or 7:30. I look at my email, try to wake up, and a few cups of tea later I’m ready for space! A lot of what I do depends on which mission I’m working on, whether it’s MSL or Juno. For MSL, the day starts with the downlink assessment that I mentioned earlier. We start right in the morning and look through all of the telemetry we downlinked overnight and early that morning. We finish that right as the uplink team begins their planning. They take over from there and plan out the whole day’s worth of activities, such as where the rover’s going to drive, what we’re going to image, where we might drill, and so on. For the downlink team, we have to have our work completed relatively early in the morning to let the uplink team know the instrument is healthy can use the camera for the next day’s worth of planning. For Juno it’s a little different. While MSL is planning just about every day, Juno is much more spread out since we’re in an elliptical orbit around Jupiter. It takes us about 53 days to get from the equator all the way back around again (these are called Perijoves). When we image the cloud tops of Jupiter, we have a two-hour swath of time that spans the North Pole to the South Pole. To determine what we’re going to image, we’re talk with the co-investigator of the instrument and get her requests such as imaging the north and south poles, acquiring an image at such and such time with whatever compression she would like, etc. We take those requests and turn them into imaging commands the spacecraft can understand. All of that work is done within the span of a few days. After the spacecraft acquires the images and begins sending them back to Earth (which is usually over the course of a few days to a week or so) my work turns into the same thing I do for MSL. This involves looking at all the images, making sure everything was acquired appropriately, making sure the camera is within temperature limits and so on. From there, we push the images out to our public website which the public can then download, process, and share them with the world. In my off time, when we aren’t acquiring images, I do a lot of programming at work, whether it’s writing a program to help us perform a task easier, fix a bug, or even implement a new idea we can use in the future. I wrote a lot of the programs we use in our ground software for planning with JunoCam. We have a small team and kept a lot of the work inside the group itself. What tools do you use as a Mars geologist? As a geologist, we use the same kind of tools that a geologist on Earth would use. For MSL, we have multiple instruments to help determine composition of rocks, brush off dust for better views, as well as color cameras to see the area around us. For the cameras, we have the two Mastcams (34mm and 100mm cameras) which are mounted on top of mast of the rover. These are very similar (functionality-wise) to regular point and shoot cameras that can be bought at a consumer electronics store. We use those to survey the landscape around us. On the end of the arm of the rover, we have another camera called MAHLI, which stands for the Mars Hand Lens Imager. That camera is the same idea as a geologist’s hand lens. A hand lens allows you to magnify small rocks to better view the grain structure or other minute features of the rock. That was the idea of the MAHLI instrument. It was placed on the arm of the rover so we can hold it up very close to a rock. The camera can actually get about 2 centimeters away from a rock which lets us get a very high-resolution image. We use MAHLI to image the drill holes we create. The drill bit itself is only about the width of a U.S. dime, around a centimeter in diameter, but when viewed in the images, it can fill the entire screen. As a Mars geologist, we use many of the same types of instruments that a geologist on Earth would use; the main difference being that it’s all remotely controlled, and of course much more durable for space. What are some geological features of Mars that fascinate you the most? Personally, the volcanoes are the most interesting. I will admit, that is very biased since I’m a volcanologist. Aside from the volcano I studied, Apollinaris Mons, I think the Tharsis region is very interesting with its three main volcanoes, Arsia, Pavonis, and Ascraeus Mons. There is also Olympus Mons, the tallest volcano in the solar system, but not the largest—that’s Alba Mons. Martian volcanoes also have an interesting history since they all started with explosive eruptions, but at some point in Mars’s history, relatively recent geologic history, all the volcanoes throughout the planet changed to an effusive eruption. Personally, I think that’s one of the most interesting things. There are various theories as to what caused the change, and I will admit, I haven really settled on one myself. What do you think are some common misconceptions about Mars that you would like to clear up? While there isn’t any one thing in particular, there are various topics people don’t think about in general (I myself did the same thing before entering the field). Those are the kinds of things I mention during outreach events when people ask questions about different geologic processes on Mars. For example, the same processes we see here on Earth act much differently on Mars, Venus, and even on the Moon. One thing I always mention is that, just like Earth, Mars has an atmosphere, but it’s very thin and a different composition. It also has only one-third the gravity since the planet is only about half as large as Earth. We need to take these variables into consideration when trying to determine how something may have occurred geologically in Mars’s past. For example, with a lower gravity and thinner atmosphere, the ash, tephra, etc. from a volcano erupting on Mars will travel much farther away than it would here on Earth. It’s the same physics, but we need to retrain ourselves to also think of these other factors that normally we never think about here on Earth. How does your work impact a potential future of humans on Mars? One of the impacts is figuring out not only where the next Rover is going to land, but potentially where humans may land in the future. The area the Curiosity rover landed, Gale Crater, is an area that we know had flowing water in the past. That’s one of the reasons why the landing site was chosen. That’s also what is being worked on with the future 2020 rover right now. All of that lends a hand in determining where humans may live on Mars in the future. When humans do finally land on the red planet, they need to be in an area that is scientifically interesting and somewhere a lot of information will be learned. An area that had water in the past is always important because, while there are certainly no guarantees, if water was there in the past, it had a better chance of harboring life. What theories and paradigms about Martian geology have been revised or thrown out from recent data? I always like to say the work I did on my volcano. Even though it wasn’t anything groundbreaking, the newer CTX images allowed me to slightly revise the knowledge we had about the geologic history of the volcano. I wouldn’t necessarily say “thrown out” since the original authors said they could only estimate based on the resolution of data they had at the time. When Curiosity landed, the main goal of the mission was to figure out if Mars was a habitable environment for life in the past. The mission wasn’t trying to find life specifically, but we wanted to determine if Mars could have harbored life at one point in its past. The science team on the mission figured that out only a few months after landing. When we drilled our first hole into the rock, the drill tailings were grey instead of red. As a result, it turned out we were drilling into a clay which meant that a liquid had deposited it. After analyzing the drill tailings and the area we were in, it was determined that there was liquid water in the area at one point in Mars’s past such as a lakebed. Based on the composition of the rocks, we could say that yes, life could have lived there. We did not find any signs of life, but it was habitable for life. Mars could have sustained it. There has been a lot of interesting news about Mars lately, with the massive dust storm and more recently, with the discovery of an underground lake of water on Mars. What excites you the most in this era of Mars exploration? I think the fact that we as humans have technology that is able to acquire the data it can. The European Space Agency (ESA) has an orbiter that was able to detect a liquid lake under the south polar ice cap. Curiosity is on the surface still acquiring data throughout the large dust storm. We’re able to get all of this back relatively quickly. It only takes about 15 minutes to get a signal from Mars to Earth and vice versa. We have so much data coming back from Mars, it’s difficult to kind of keep up with it. I think that’s the most exciting thing for me. What future tools/probes are in development that would advance our knowledge? As I briefly mentioned earlier, the future 2020 rover, which is a similar rover to Curiosity, but will have a different payload. My company actually has a couple of cameras on it. The rover will launch in the year 2020 and land in 2021. That will be the next big rover. How would the geology of Mars impact a potential human settlement? A human settlement would be best if it’s in an area that is scientifically interesting. Something where work could be performed to further our understanding of the solar system we live in. The area will need to be studied to get as much information as possible which will also help in determining where future missions will also land. The geology of Mars has the same features Earth does, such as volcanoes, canyons, etc. We know there are areas where liquid water was flowing in the past, and now we know there is an area where liquid water is under the south polar ice cap. It’s a matter of picking out the best place to land. What do you love most about being a Mars geologist? It’s space science! That sums it up for me. It’s interesting to work on another planet, and that also applies to Jupiter as well. Even though Jupiter is a gas giant planet and there isn’t any geology specifically, when we first entered orbit, that was the first time we were able to acquire good images of its poles. We saw all sorts of cloud features that I don’t think anybody predicted. That’s what I love most about this field. There’s always something new to learn. What would you say to a young person thinking about entering your field? Definitely, absolutely, 1000 percent make sure you have both a science background and a technology/computer background. For technology and computers, knowing how they work on a low level is one of the most important things you can have. At work, we all have science backgrounds in addition to operating the cameras, and it helps with the job greatly. Whether it’s writing a program or commanding a camera, having both fields makes the job that much easier to understand. Computers are obviously the wave of the future, and knowing how technology works is going to be important in life. Having a strong, low-level understanding of all aspects of the job, both from the science and the technology points of view, are the most important things to have. How can we as citizens learn more about Mars? Everything we acquire is disseminated for free. You don’t need to have any specialized account to access it. One of the things I also do on the side is prepare our data for the NASA Planetary Data System (PDS) on both MSL and Juno. Every three to four months, all of the images we acquired and received on Earth are collected together. We process them and send them to the NASA PDS, which is NASA’s repository for the data its missions have acquired. That is all freely available to everyone online, whether it’s images a camera has acquired, or topographical data from a planetary surface (such as the MOLA topographical instrument). All data is online and free. Would it be possible to terraform Mars at some point in the future? I honestly do not really know since that’s outside of my field of study. To live on Mars, one would need to have a lot of technology. There are a lot of factors that need to be taken into consideration such as gravity and atmosphere. Additionally, the radiation in Mars’s environment as well. Terraforming is outside of my field, so I could not give a correct answer to that. I think it would certainly great if it was possible, but I do not know. A hundred years from now, who knows how the technology of that time might have advanced. Only time will tell! What are some other questions you would like for me to ask? The biggest one I always say, and I’m glad it was asked earlier: “what would you say to a young person going to enter your field?” To me, this is even more important than discussing how Mars has different gravity from Earth, and how we as scientists need to take that all into consideration. I always like telling young people interested in the field what they should focus on. Whether they’re in elementary school or already in college, I think that’s the most important thing anybody could bring up. As a second piece of information, if you want to enter any sort of scientific field, make sure you have good communication skills. In addition to geology, I also have a speech communication degree, and that has helped out greatly. As a scientist, we disseminate results by publishing peer-reviewed papers in scientific journals, attending scientific conferences, etc. You can be the most brilliant scientist, but if you can’t communicate, you’re not going to be able to get your results out there. That is something I always want people to know when it comes to science.